Trees and shrubs potentially grow in just about every situation imaginable on land (except in the most extreme environments) – given the chance. They are not confined to ‘woods’ and so it follows that wood-decay invertebrates can occur in any situation where trees and shrubs grow and where they have survived long enough to produce dead woody tissues which are then available for fungal decay. In the wildwood, even the least mobile species could find suitable habitat from one generation to the next. Nowadays, mobility– the ability to colonise between fragmented and isolated areas of suitable habitat – is a key factor in determining the presence or absence of species. Species with low mobility have mostly become confined to sites which have remained suitable for long periods of time and which are connected to suitable habitat. Fragmentation and increasing isolation leads to attrition, as species-abundance fluctuates and occasionally drops enough for local extinctions to occur. The sites which appear to have the richest assemblages of rare and threatened fungi (according to sightings of fruit bodies) are more or less the same sites that are known to be richest in wood decay invertebrates and epiphytic lichens. We are far from understanding the reasons for this but it is believed that limited mobility is a key factor, as with invertebrates, even though fungal spores are mainly wind-dispersed. 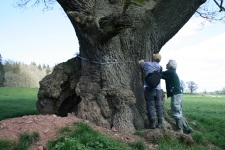 These ecologically species-rich sites tend to be the classic old growth areas, where a long and continuous history of land management which favours the development of ancient and veteran trees has been demonstrated. Traditional orchards, especially where lying within former medieval forest areas. 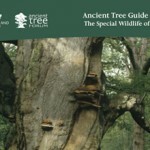 See our section on Ancient tree sites to visit for a full list of sites in England, Wales, Scotland and Northern Ireland.